Phineas Taylor Barnum was an American businessman and showman who is best remembered as the founder of the Barnum & Bailey Circus in 1871. After 146 years, the circus closed in 2017. 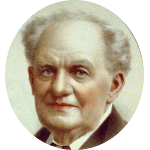 P. T. Barnum was also a politician who served as Mayor of Bridgeport, Connecticut, and as a member of the Connecticut House of Representatives from the Fairfield district. P. T. Barnum and his circus were the inspiration for the 2017 musical The Greatest Showman starring Hugh Jackman as P. T. Barnum. One of the more interesting family connections for P. T. Barnum is his connection to one of his most memorable circus performers, Charles Stratton, whose stage name was General Tom Thumb. P. T. Barnum also had a couple of Civil War generals in his family tree, General William Tecumseh Sherman and General George B. McClellan. U.S Presidential kin include Calvin Coolidge, Gerald Ford, and George W. Bush. Celebrities who are related to P. T. Barnum include Janis Joplin, Chevy Chase, Chris Pratt, Anna Gunn, Edward Norton, Ed Helms, Ben Affleck, and Paget Brewster. Other founders of notable businesses in his family tree include Bill Gates (Microsoft), W. K. Kellogg (Kellogg), Lee B. Loomis (Loomis Armored Car), and Gilbert Clifford Noble (Barnes & Noble).